Karl Marlantes, a Yale graduate and former Rhodes Scholar who left academia to serve as a Marine Corps officer in the Vietnam War, spent decades working on his book, then faced multiple rejections in trying to get it published. Kudos to the people at Grove Press for having the sense and good taste to finally release it when so many others wouldn't. 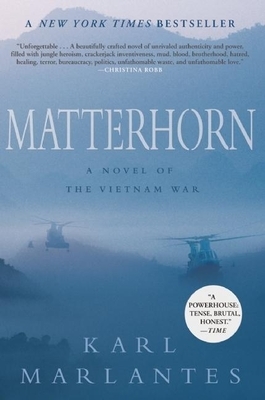 An incredible publishing story--written over the course of thirty years by a highly decorated Vietnam veteran, a New York Times best seller for sixteen weeks, a National Indie Next and a USA Today best seller--Matterhorn has been hailed as a "brilliant account of war" (New York Times Book Review). Now out in paperback, Matterhorn is an epic war novel in the tradition of Norman Mailer's The Naked and the Dead and James Jones's The Thin Red Line. It is the timeless story of a young Marine lieutenant, Waino Mellas, and his comrades in Bravo Company, who are dropped into the mountain jungle of Vietnam as boys and forced to fight their way into manhood. Standing in their way are not merely the North Vietnamese but also monsoon rain and mud, leeches and tigers, disease and malnutrition. Almost as daunting, it turns out, are the obstacles they discover between each other: racial tension, competing ambitions, and duplicitous superior officers. But when the company finds itself surrounded and outnumbered by a massive enemy regiment, the Marines are thrust into the raw and all-consuming terror of combat. The experience will change them forever. Matterhorn is a visceral and spellbinding novel about what it is like to be a young man at war. It is an unforgettable novel that transforms the tragedy of Vietnam into a powerful and universal story of courage, camaraderie, and sacrifice: a parable not only of the war in Vietnam but of all war, and a testament to the redemptive power of literature.